Red eye is an abnormal case in which the white part of the eye ( sclera and conjunctiva ) appears red. 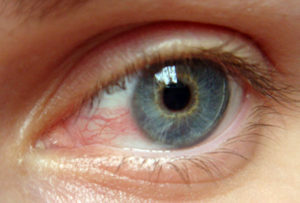 This usually occurs due to injection of blood vessels of the conjunctiva or sclera or due to bleeding in the same area. 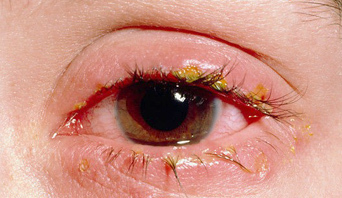 Conjunctivitis : This is inflammation of conjunctiva which is the fine layer that covers the white part of the eye and lines the eyelids. This inflammation may be microbic or allergic. 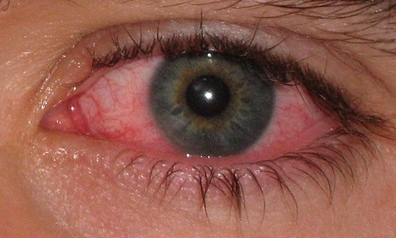 It is the most common cause of red eye ,and usually treated by drops and ointments. Blepharitis : It is the inflammation of edges of upper and lower eyelids, and usually accompanied by scaling near the eyelashes. It is usually treated by drops and ointments along with daily cleaning of the eyelids by special eye shampoo or any baby shampoo. 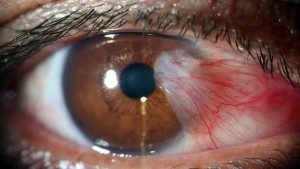 Subconjunctival hemorrhage: It is bleeding below the conjunctiva which is mostly due to rupture of small conjunctival capillaries after squeezing of the body as in cough, sneezing, shouting or handling a heavy thing. Is resolves spontaneously without any treatment. 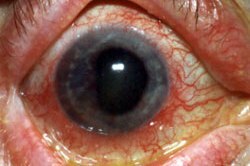 Scleritis : It is inflammation of sclera and the very fine blood vessels that cover it. Mostly it has autoimmune pathogenesis and needs special treatment. 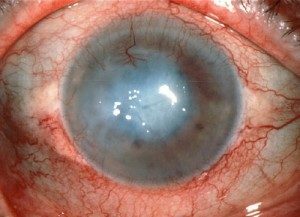 Episcleritis : It is inflammation of the layer and vessels over the sclera, which is usually mild and responds to topical drops. 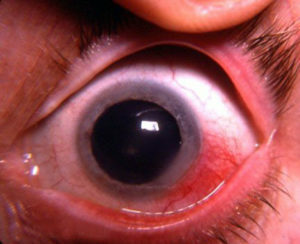 Pterygium : It is horizontal growth of conjunctiva from the inner side of the eye over the cornea toward the pupil. If big enough it should be taken out by a simple operation. Dry eye syndrome : It is dryness of the eye due to decreased stability of the tear film which is either because of decreased quantity or quality of the tears , or due to increased evaporation of the tear film. It is usually treated by artificial tear drops. Glaucoma : If the eye pressure is too high it may cause what we call acute glaucoma crisis and red eye along with hazy vision and pain. Glaucoma should be treated by drops, laser or surgical operation according to the case. Injury : Foreign bodies cause eye redness due to injuryof the cornea , conjunctiva or other eye tissues. This may be caused by sharp or blunt trauma or chemical burns. Each one of these has different management and treatment. 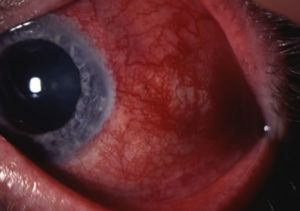 Keratitis : It is inflammation of the cornea that may be viral , bacterial , fungal ,chemical or due to contact lens use. Each of these cases needs different treatment. 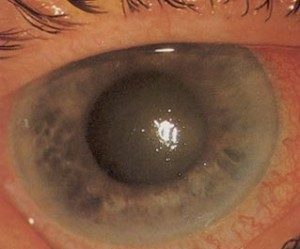 Iritis – Uveitis : It is inflammation of iris together with the ciliary body and choroid that all make the uvea. It needs long term treatment and follow up because it is usually recurrent and may be accompanied by other systemic diseases. -Diagnosis of red eye is usually done by bio-microscopic slit lamp examination in the doctor’s office but may sometime need some laboratory tests or films. -Treatment of each of these red eye cases is different, according to its cause. 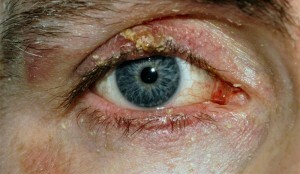 It may be done by drops, including antibiotic , steroid , antiallergic or non-steroidal anti-inflammatory drops , or by systemic treatment by oral tablets or injections, like in some kinds of uveitis that need systemic steroids, or may be surgical like in pterygium and chronic resistant glaucoma. 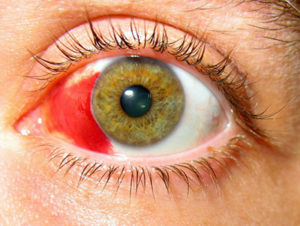 However , sometimes it needs no treatment like in subconjunctival bleeding.